I Would like to hear your opinion on this bowl. It appears to be famille rose, but it does not look that old to me. 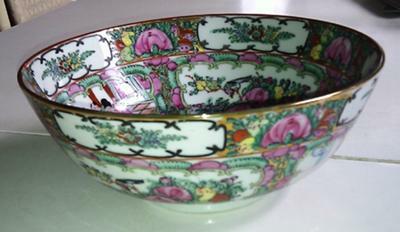 This is a famille rose bowl. The mark is a bit unusual. 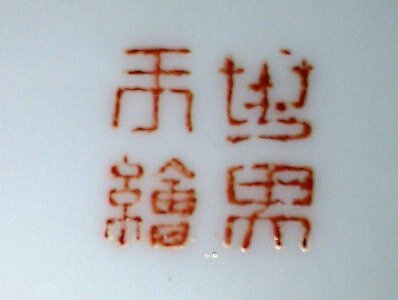 Cannot read the right part (a name), the left one says "handpainted". 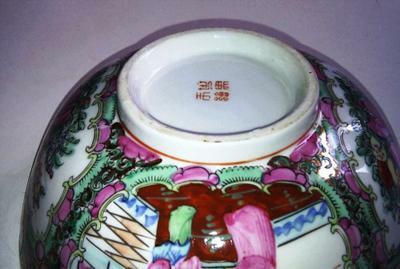 Originally, these items had no marks at all, then from the late 19th century "China" or "Made in China" was added. 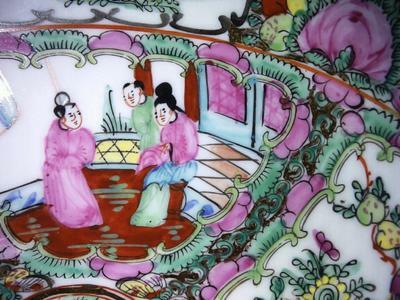 This one indicates that the painting either was not done in China itself (perhaps in Hong Kong or Macao), or it is a later product. Famille rose items are possibly still being made. Later ones are frequently printed. They can be recognized by their smooth surface. You may find many similar famille rose items of different periods by doing a Google search for "famille rose".